This extraordinary antique Sultanabad relies on exquisite detail and finesse of drawing. Antique Oversize Persian Ziegler Sultanabad Rug, Country of Origin / Rug Type: Persian Rugs, Circa date: Late 19th Century – In contrast to many of the greatest antique rugs of Ziegler Sultanabad rugs, whose emphasis is on the monumental effect of large sweeping forms, this extraordinary example relies on exquisite detail and finesse of drawing. The mina khani, a fine trellis of richly colored palmettes and small flowers, sprawls across the deep blue field, pulsating with alternating rhythms in contrasting reds, blues, greens, yellows, and ivories. The grand yet lace-like effect of the field picks up again in the red-ground border, set off not only by its color, but also by thin, finely detailed guard borders. 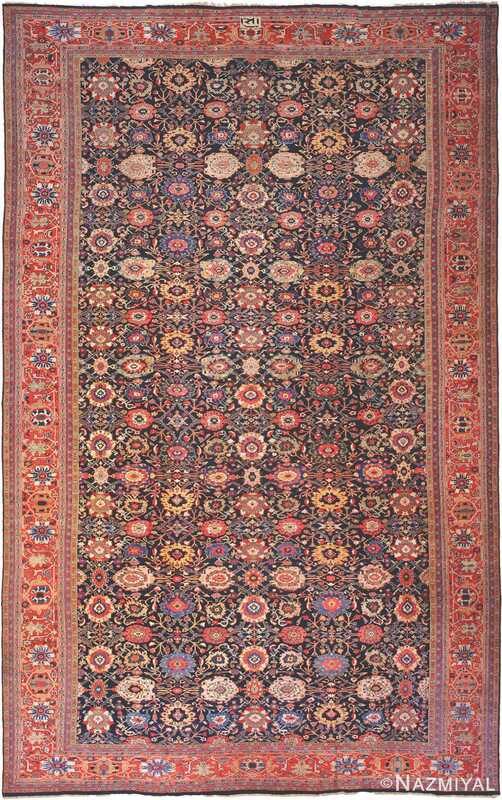 This antique Persian Ziegler Sultanabad Carpet is a masterful work of art and by no means is it “just” a decorative carpet!